The city was approaching its peak as a commerical center, unaware of the future impacts of the interstate highway under construction at the time north of the city. Mandan boasted five elevators, with a combined capacity of over 760,000 bushels. Occident Elevator had two facilities, one located in the "Syndicate" area and the second along Main Street. The other grain storage and handling businesses included Slope Grain and Feed Company; the Farmers Union Grain Association and the Mandan Farmers Co-Op Elevator. On January 30, firefighters battled a six hour long fire in sub-freezing weather to extinguish one of the largest fires in Mandan's history. 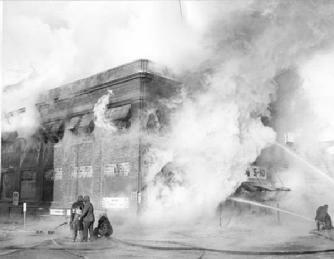 The Hulette Building, home to the city's Ben Franklin 5-and-dime store, was a complete loss. Damage was estimated at $200,000 ($1.7 million 2015$). Fortunately, no loss of life or significant injuries occurred due to the event. Much of the information presented on this page is based on the research conducted by Diane Boit on assignment to the Mandan News in her weekly "Those were the Days" columns.